Summary for the Busy Executive: Wow. Forty years ago, very few outside Austria knew the name Franz Schmidt. An essay by Harold Truscott in Robert Simpson's volume The Symphony, Volume 2: From Elgar to the Present Day whetted my appetite and probably those of many others, but until Zubin Mehta's pioneer Decca stereo recording of Schmidt's fourth symphony, the music went largely unheard. As far as I know, no major conductor with an international career consistently championed Schmidt's work (unlike the case of Mahler), although the situation has greatly improved. The standard rap against Schmidt was that his music didn't "travel" outside Austria, and consequently it apparently was seldom given the chance to prove that it could. At least we now have recordings of all the symphonies. Recordings of other works are kind of dribbling in. 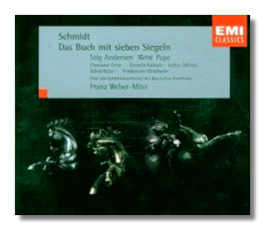 As a composer, Schmidt stands fairly close to Mahler and also Reger. Each of men's music faces, like Janus, two centuries: the nineteenth and the twentieth. Each brings Romanticism to a peak, and each gazes like Moses on Horeb toward Modernism, without fully entering into it. I'd call it transitional music, were Mahler and Schmidt, at least, not so completely convincing on their own. Furthermore, music histories tend to present musical eras as cleanly separate: the idea that once Beethoven enters his middle period, there are no more Classical composers. In reality, however, movements tend to bleed into one another, like colors on a spectrum. Modernist prophets appear early (eg, Mussorgsky), and Romantics hang on. Georg Schumann, a Wagnerian, died in the Fifties. And, of course, elements are often blended in the same composer – Mahler and Mussorgsky conspicuous examples. In short, no single composer fully represents his time but embraces a larger or smaller piece of it. Schmidt's music falls into roughly five periods of development, four of which are conveniently represented by his symphonies – the first symphony for the first period, the second for the second, and so on. The fifth period includes only his last composition – Das Buch mit sieben Siegeln (the book with seven seals) – of what I've heard, by far the greatest thing he wrote, and that's saying something. Its première in Vienna earned for him a huge success, but its visibility sank with that of the composer. I would recommend this to any lover of Mahler or Bruckner without hesitation – one of the supreme examples of late Romantic Viennese music. Although the work has been recorded previously, I believe this CD counts as its first recording from a major label, roughly sixty years after Schmidt composed it. I haven't heard even of a lot of live performances as recently as ten years ago, and I first encountered mention of the work in Truscott's 1967 essay. Indeed, Welser-Möst is the only one I know of who's programmed it recently. It's a masterpiece, overwhelming in its impact. I don't hesitate to call it the greatest Romantic chorus-and-orchestra work since Mahler's Symphony of a Thousand. It has the same grand scale and amazing craft in handling large forces. I suspect its obscurity due mainly to its considerable performing difficulty. Welser-Möst scheduled a performance with the Cleveland Orchestra and Chorus and had to postpone it by at least a year. I have no idea how long he worked with the Bavarians, but this is one great account. It confirms both the stature of the work and of the conductor who can both keep its tight, complex textures clear and still make music. This is a performance of both sweep and astonishing detail. On the basis of this reading alone, I'd call Welser-Möst one of the best conductors now working. The nineteenth-century oratorio has two main strains. One continues the practice of Handel: essentially, a collection of separate numbers, as in Mendelssohn's Elijah. The other creates a continuous, through-composed fabric, as in Wagner's Liebesmahl der Apostel or even the two movements of Mahler's Symphony #8. Both approaches have their advantages and drawbacks. With separate numbers, one sacrifices the flexibility of the drama. With the continuous flow, one risks sinking into a formless swamp. Elgar combines the two approaches in his oratorios: there are definite sections one can point to (eg, the "Demons' Chorus"), but the composer weaves them into a continuous line. Schmidt does the same, with the added wrinkle that he uses a comparatively small stock of ideas and varies them as he would vary a set of symphonic themes. It wouldn't surprise me to learn that Mahler's Eighth influenced him in this regard. We end up with an extremely tight work. This has great consequence for Schmidt's choice of subject. The Book of Revelations has appealed to artists of all sorts for its breadth of vision, stunning imagery, and ringing (not always comprehensible) poetry. The book simply read aloud makes a splendid noise all by itself. Adapting the work to other media has seldom succeeded. Even a master like Dürer gets flummoxed by the wealth of imagery, which overwhelms his drawings and turns them into an odd sort of kitsch. Vaughan Williams' Sancta Civitas succeeds by relentless cuts (the entire oratorio lasts a little over half an hour) and leaves the listener with the fleetingness of the vision. Schmidt uses not only Revelations but also textual elaborations, many based on psalms. I don't know whether he wrote them. Schmidt's is the only work I know that takes in the full measure of Revelations and yet keeps a definite shape. He does this by choosing a symphonic idiom that needs room to make its point and by a mastery of form and drama. There is a wide range of expression: from pastoral simplicity in the description of the Lamb of God to hair-raising complexity that pushes tonality up to the edge and occasionally steps over. To create this wide range, Schmidt requires six soloists and large chorus, as well as a huge orchestra. He asks for a Heldentenor as well as a "normal" tenor, the first representing St. John who announces his vision in carillon-like music and who narrates, the second used for various characters and lyrical commentary. The chorus also takes many parts, from angels to humanity destroyed in the Apocalypse to the army of martyrs. This is, above all, a dramatic oratorio, in that its points are made through characters. Aside from the strength of every section, Schmidt also gets great effect through contrast. The riders' havoc is a matter not only of immense powers and grand vistas but also of one or two individuals overawed by what happens around them. After the destruction wreaked by the rider on the pale horse, two numbed survivors brokenly try to talk of what they have seen. Indeed, each has trouble recognizing the other as human – a quiet moment after a noisy one, and all the more powerful for the immediate contrast. The range of Schmidt's expression is most easily heard in the five fugues (four for voices, one for organ) of the oratorio. The first, for the solo quartet, depicting the praise of the four beasts ("Heilig ist Gott der Allmächtige" – holy is God the almighty) is the simplest and most harmonious. Although a fugue, it moves very much like a chorale. The second, a "war" fugue, tells of the second rider, sent to make men war with one another. It's filled with trumpet calls and snare drums, with the idiom itself highly chromatic but the actual themes sharply incised. The third depicts the earthquake loosed by the sixth seal. This, technically speaking, is tonal music, but you'd be hard pressed to identify the tonic. In fact, it reminds me very much of Schoenberg's freely atonal music of roughly twenty years previous. Though the music portrays chaos, it is not chaotic itself. You get the feeling of whirlwinds and humanity's cries coming out of vortices, and, as Emily Dickinson said of the effect of real poetry, "the top of your head coming off" – so ear-stretching, you may find yourself raising your eyebrows over your sideburns. The organ fugue harkens back to the Lisztian fantasia-fugue, like Liszt's own fugue on BACH – highly chromatic, with the feeling of improvisation. The final fugue is a beaut: a quadruple fugue – four subjects combining and recombining as the chorus and the seven trumpets call the souls to the last judgment and praise the judgments and the reign of the Lord. "Difficult" doesn't begin to describe it. The conventional composer would probably end here or at least in some glorious blaze, but Schmidt avoids the conventional. His "Hallelujah" chorus is appropriately grandiloquent, but it leads to a late-Romantic version of Gregorian chant, given to the a cappella male chorus singing in unison. The actual end is St. John exhorting all to heed his vision, sung to the opening carillon-like music. The performance isn't perfect, any more than every performance of Mahler's Eighth I've ever heard. It's big, hard, complex, and complicated. Strings are here and there rhythmically ragged. How the choir gets through some of its stuff, particularly the "earthquake" fugue, I don't know. I know I would be hanging on by my fingernails. But they do get through it. In fact, everyone does and triumphantly, to boot. The diction from everyone is excellent, even considering those sections where the music seems to throw off more lines than one human being can comprehend. Amidst the mighty whirlwinds, the performers communicate. One hears music and drama, rather than notes. A great moment, and one of the simplest, describes the long silence in heaven after the Lamb opens the seventh seal. The music is so bare, it tempts one to slide over it. Welser-Möst, however, pours intensity into it. This isn't a break, but anticipation. The sound is acceptable, if not remarkable. The main problem of balance of forces and textural clarity has been solved.